We're glad you're here! Feel free to browse through our website to find out all you need to know about the fellowship at New Market United Methodist Church - from service times to our beliefs. 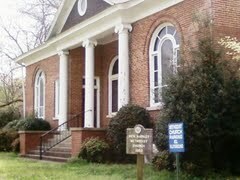 The church is located at 310 Hurricane Road in New Market, Alabama. Click here for a map to our location. The food pantry is open by appointment Monday-through-Friday 8 am until 4:30 pm. Call (256) 829-8862 between 8:30 am and 10:30 am to schedule an appointment.